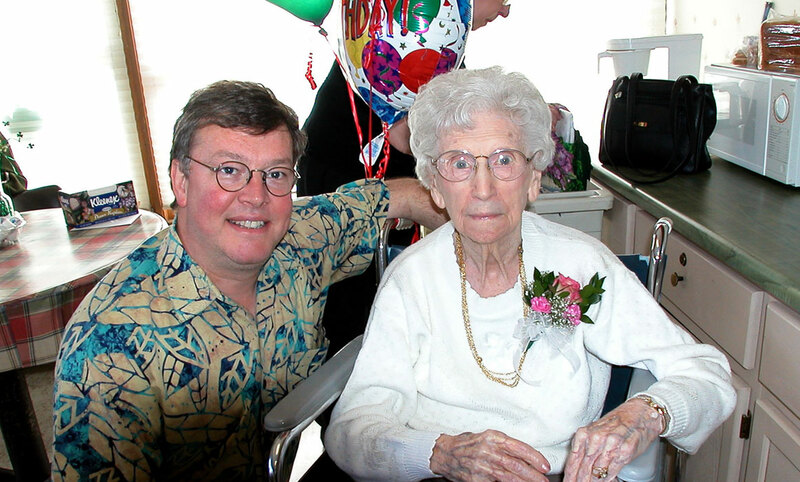 My Grandmother – and avid Green Bay Packer fan – turned 100 years old today! Kelly and I flew to Green Bay to help her celebrate. We saw most of my family. We first visited my sister and brother-in-law at their new home. The next day we drove to Packerland for the party. My Grandmother looked and sounded great. It left me wondering if I’d like to live to 100. Not if I have to work 40 more years, thank you. I’ll pass. We flew to Wisconsin without much of a plan – I prefer it that way – less chance to be disappointed if you don’t have a plan. Anyway, as it turns out, we did not do much of what we thought we might do. We thought we might visit friends in Madison, but that trip never materialized. We thought we might make a trip to Milwaukee for dinner at Elsa’s on the Park. Nope, never did that. Instead, on a whim, we visited an old friend in Williams Bay, Wisconsin, and had so much fun that we stayed for three nights. Steve has a charming home with a cozy guest bedroom, huge master bedroom upstairs and a full basement stocked with 700 bottles of wine. Now you know half the reason we stayed so long. The other half? Steve’s blue and gold macaw, Caesar. Kelly loves all animals – especially talkative, colorful ones. Unfortunately for Kelly, the feeling was not mutual. It seems this bird doesn’t care much for women. One thing I did not expect to do was have lunch with an ex-girlfriend. Aina and I “went together” more than 20 years ago. (Sorry – that’s about as precise as I get with dates.) Seeing her for two hours was one of the high points of the trip. She’s as bright and as wonderful as I remember her – maybe more so. And, she looks exactly the same as she did when she was 21. Amazing. Of course, no trip to Wisconsin would be complete without a stop at John’s Main Event in Burlington. As always, it was great to see Jimmy D. and Mark. Great friends. Good conversation. Cheap beer. In that order. We ended our all-too-brief stay in the midwest at Kurt and Carla’s. As with all the rest, we wish we had been able to spend more time together. (Yes, they also have birds.) Kurt proved to me that it was possible to find good sushi in Illinois. Hi Jim, it’s your ole’ Ktown buddy from Michigan, always check your site from time-to-time, and thought i’d send you mine. There’s some great pics from my Year up north in a cabin in the woods… very “thoreau – like”.